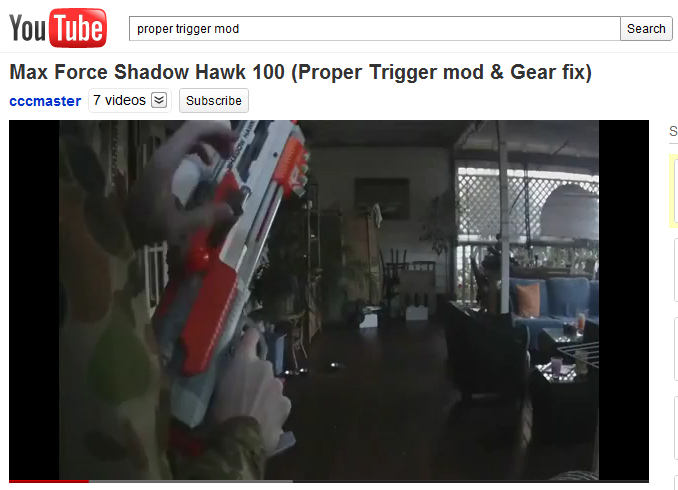 Max Force: Shadow Hawk 100 Trigger Mod.. Ubercool! We plan to do more in future, but I alas had some serious deadlines to hit for my day job that I had to get back to, and I am flying out of the country over the weekend, so we did do our best for now:) Videos after the jump. Nerf Vortex: Let's do this. 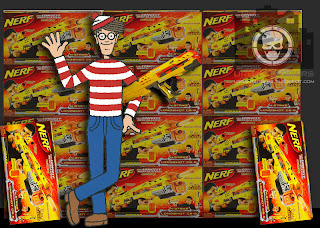 Tall calls, but one tends to put a lot of faith in dem smart peeps at Nerf releasing high grade kit. 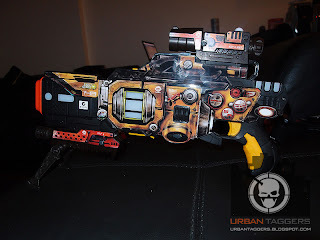 Anyway you've seen the previews and the pics, read the press releases, so really there's not much else left than to get stuck into the new Vortex line and see what all the fuss is about first hand... and so we did:) Nitron, Praxis, Vigilon + Proton? Damn Skippy! A big fan of Tron: Legacy are we, so we got really excited when we saw these on Nerf Mods & Reviews and thought these Tron themed blasters were absolutely trick. 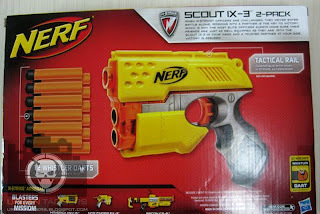 They're also Nerf gun knock offs, and actually now that I think about it, there weren't blasters in the film..
"Wanted to send along word that several of the Scout 2-packs are suddenly available for $19.99 US at the Huntington, West Virginia Big K (or Big K-Mart, or whatever it is) in a dumpy, ramshackle back room devoted to toys. It was surreal to find them there, in this Island of Misfit Toys with no air conditioning." So there you have it folks... cool stuff is everywhere..if you're willing to look for it! More videos sent to us from Joel of the Light Strike ITS motorised target. First vids here are the ITS in Sentry mode. And finally a video of the ITS in Medic mode. As I said, I haven't seen these in Australia yet but I'll make it my mission to see if I can pick one up on my US trip. 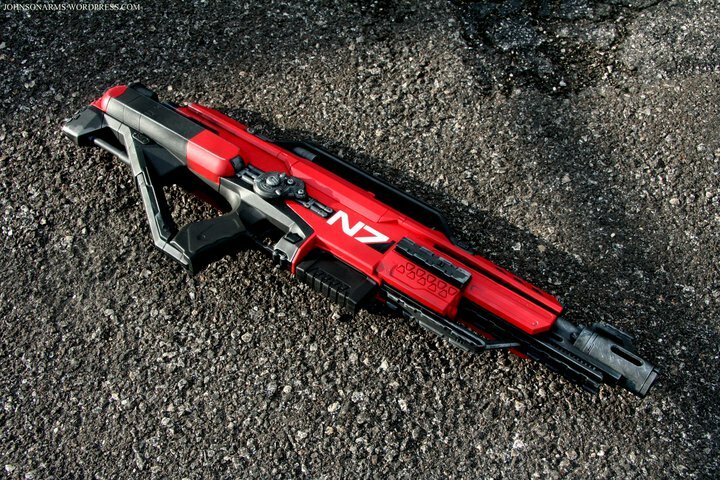 From these vids anyway, I think it'll definitely add another layer of playability to the Light Strike like. Thanks again Joel for the vids! It's got some serious punch on it, and I'm loving the ranges.. 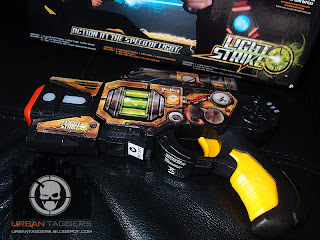 I just have trouble actually HITTING my target..
One of our readers has picked up the Light Strike I.T.S- it's an advanced motorised target that offers a bootload of advanced features like remote bomb, medic mode and sentry targets. I've yet to personally see them in Australia so I can't comment other than what I've read, but we've also been sent a few videos so hopefully that should help fill in the gaps. Thanks a ton Joel! 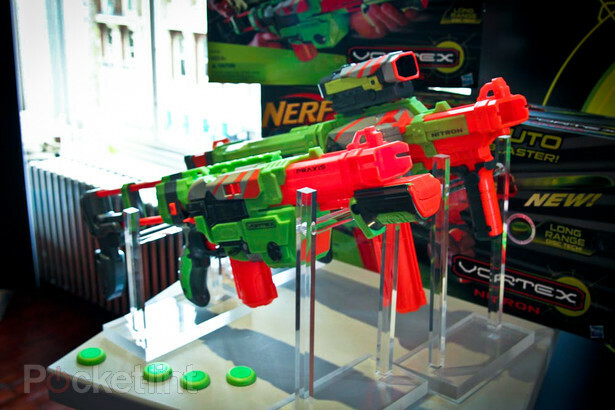 More Nerf Vortex pics- this time from Comic Con 201. More pics on Basic Nerf. 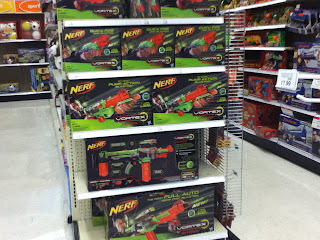 Nerf Vortex spotted @ US Toys R Us: Guess they didn't get the memo.. 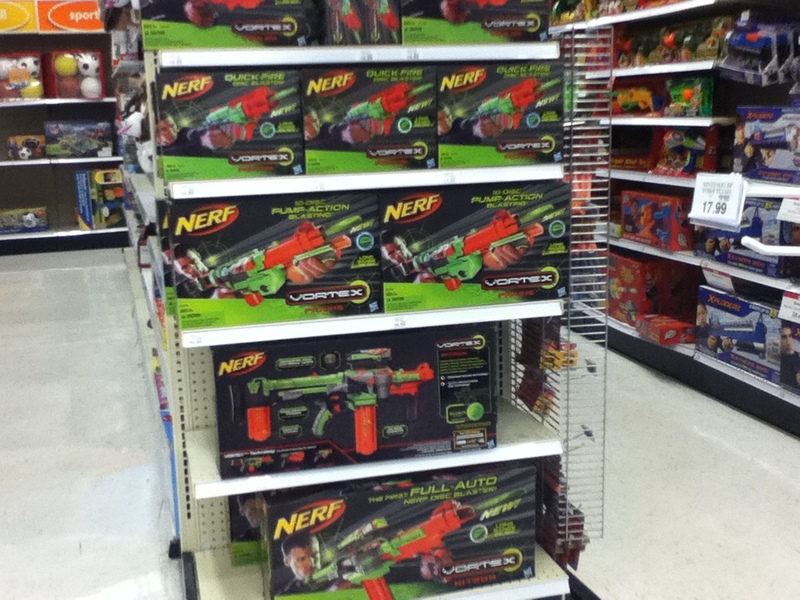 In very interesting news brought to our attention from the blog Aidan Wolf Nerf, it would appear at least one Toys R Us store in the US have already started to stack their shelves with the upcoming Nerf Vortex line. Prices are apparently pretty exi by US standards although no doubt they'll be quite a bit more here in Australia when they eventually come out. If anyone else has spotted them at their stores prematurely, I'd be very interested to hear about it. 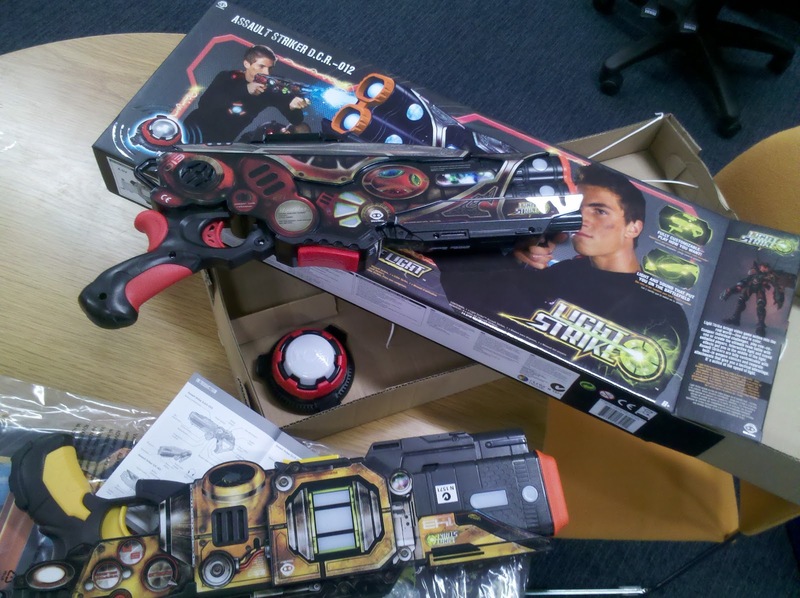 :) You just gotta laugh.. 9-10-11 Vortex has to be the most botched up PR campaign ever for generating hype ever..
See more pics at AidanWolf Nerf. Note: Foam from Above also scored the a Gear Up Package- they've got some pretty solid coverage on their blog. We're starting to get more Nerf Vortex news appearing in our newsfeeds; as the official launch date of September 10 2011 draws closer I guess it makes sense for Hasbro to want to hype up the new gear to lead up to the release, so they are obviously pumping out a lot of press releases to the mainstream media. 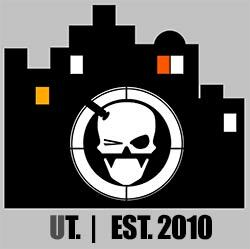 Check out the links below for more, but admittedly it's mostly the same PR press release stuff that we sort of already know. 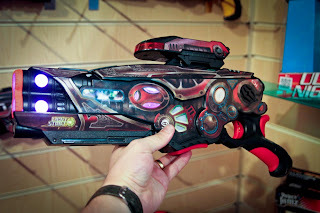 UK Gadget blog Pocket-Lint have posted some very schmick hands-on photos of the new upcoming Nerf Vortex range. Excited yet? 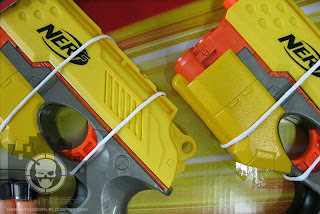 We've been puzzling over the idea of dual wielding Light Strike blasters for a few days now; and after some advice from some smart cookies in the know and lots of trial and error, I think we've got it covered. Firstly, you need to understand that if you're using your Light Strike tagger by itself without the vest, the inbuilt sensors record your health status. 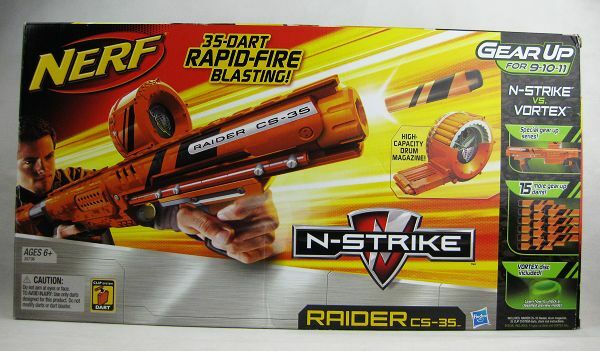 If however you pair the blaster with a target vest, the health sensor ability is 'transferred' to the vest and the blaster no longer manages that aspect. 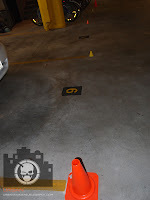 If you're firing at your opponent wearing a paired target vest, there's no point aiming at their gun; sure it'll register that you are hitting it with lights and sounds, but your opponent's health will not change at all. Recap- shoot gun if there's no vest, don't shoot gun if there IS a paired vest. 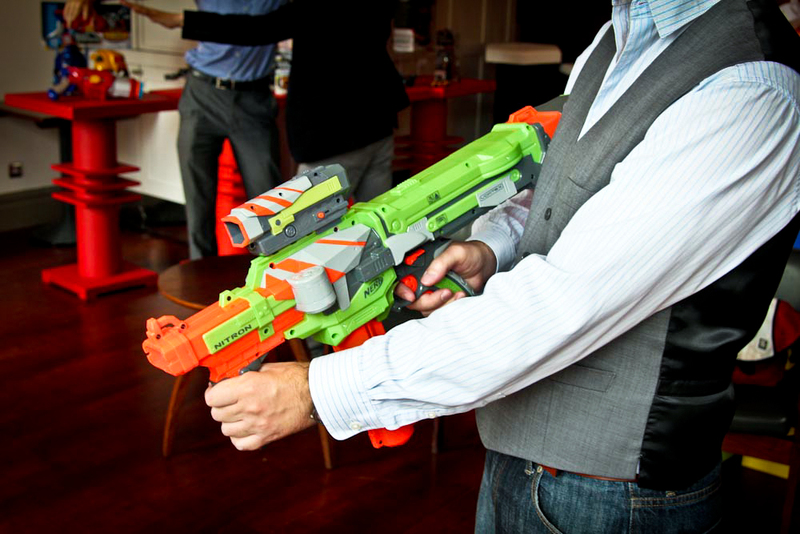 Shoot the vest. Light Strike: A pistol you say? We've punched out a few quick demo videos of the weapon customisation of the assault strikers, both with the inbuilt weapons and the attachments. You'll see some of the weapons are pretty damn powerful and it definitely now makes sense to use the shields when you're going up against an opponent with a one shot one kill attachment... Vids after the jump. 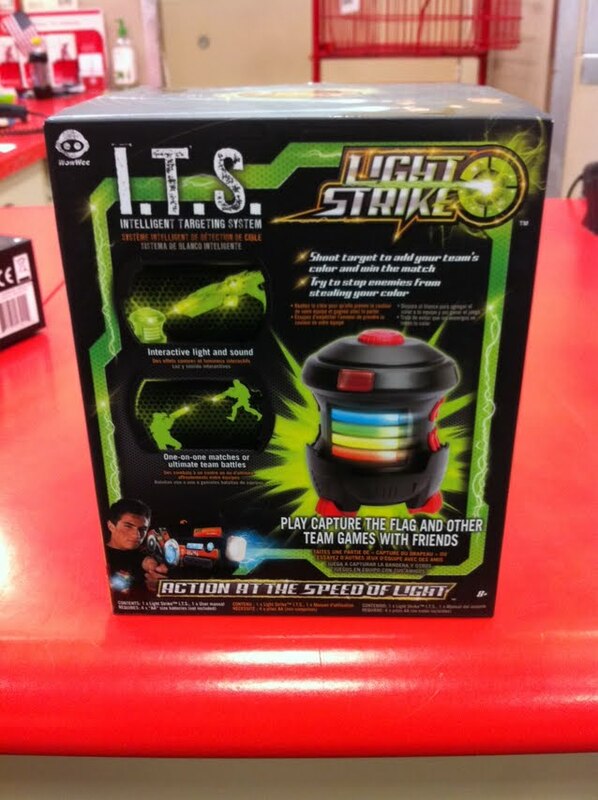 Light Strike: The full review. 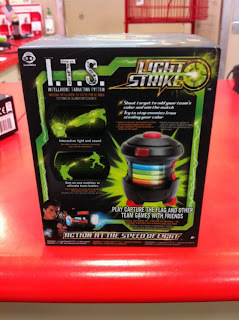 Light Strike is Wow Wee’s much anticipated new home/backyard laser tag system that we have been fortunate to get our hands on after months of speculating and waiting. 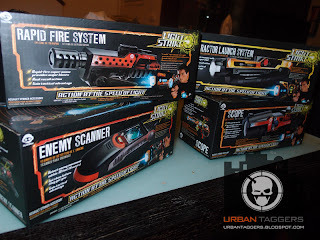 Home laser tag has always been rather lacking in Australia, even during the glory days of the 80s so it’s been exciting times for us to hear the Light Strike line would not only make it to our shores, but in a timely manner. Anyway.. get comfy because without further delay, here's our review. 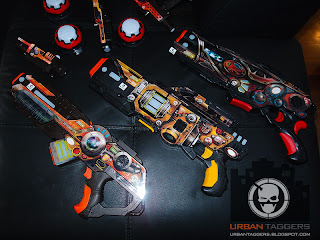 With so much functionality, a decent variety of launch products to buy and possible customisation, there’s a lot going for Wow Wee’s laser tag line.. on “paper” at least..
Light Strike: Weapon of choice? Gear up for.. tidying my living room. What a mess! Nerf's upcoming Vortex line of disc shooters have prompted a new.. 'Gear Up' paint scheme for existing N-Strike blasters. Not sure what orange, black and light grey ave to do with gearing up, but I admit in person they are kind of pretty. There's not much I can really say about repaints of old blasters, so I'll just let the pic spam do the talking. Images after the jump. Rant: X-Ploderz in Australia: Have they missed the boat? The new Xploderz XGround Poun...meh who cares?! 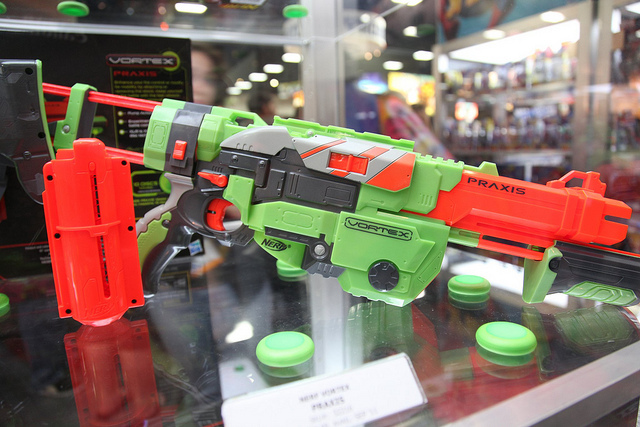 A friend of mine finally got his hands on one of the "new" X-ploderz blasters for me to look at; we've been getting various reports over the last month that the line of wet ball projectile blasters from the Maya group have been finally making their way to Australian shelves. While this is good and well, I really wonder if there are that many people in Australia that actually really care. To be honest, I can't help think that the Maya Group may have missed the boat in bringing them here to a market that may have already moved on. 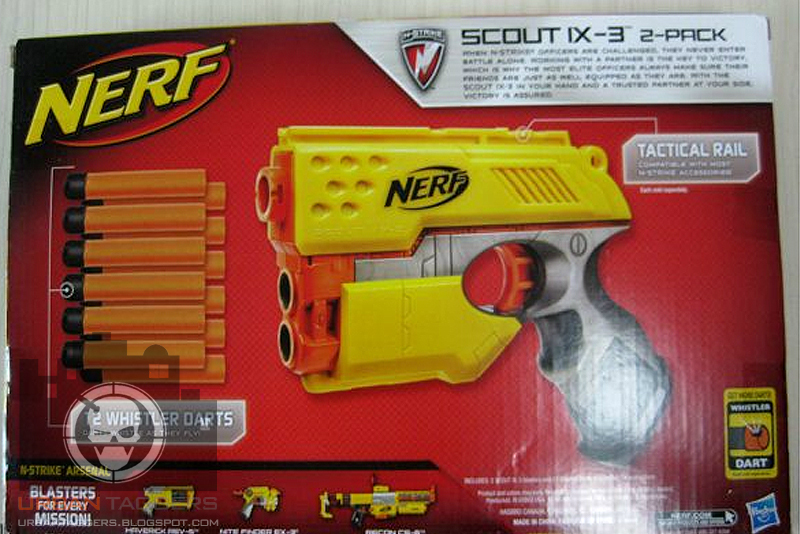 This looks pretty good though.. what do you think folks.. does the N-Strike yellow do the Scout justice? The Alpha Trooper CS-18 is pretty much my favourite Nerf blaster of choice so I thought I'd buy a couple of these new AT Unleashed Stage One kits for a rainy day. 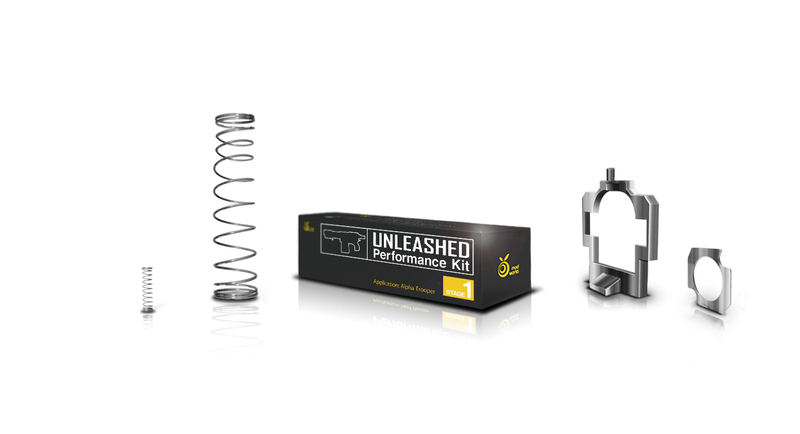 Price is very decent as is shipping to Australia, and the first 300 are in the limited stainless steel kit. 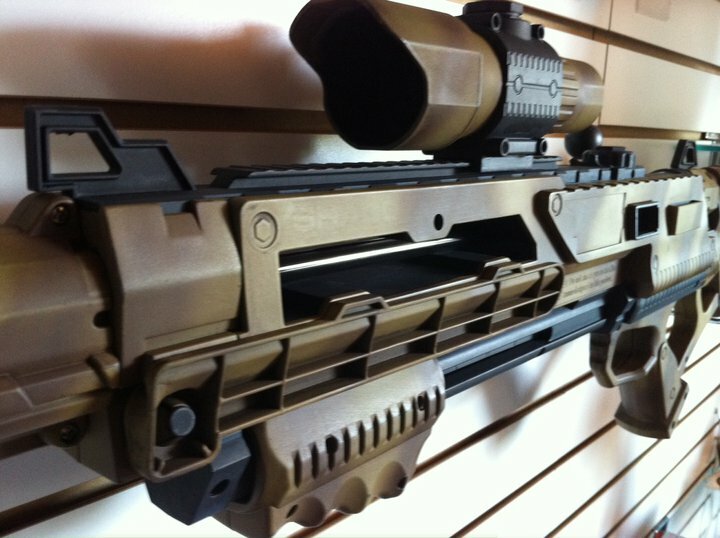 The GAR 023. 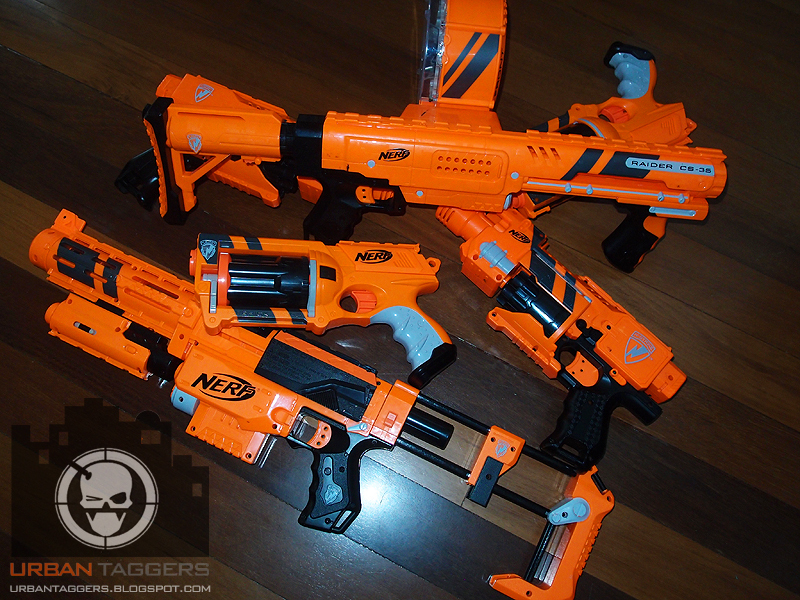 Brown + Orange..
We had a bit more of a play with the Light Strike assault blasters in the office today, adding a new 'GAR-023' Assault Striker to the mix (the 3rd design along with the yellow SR-143 and the red DCR-012). This one is probably going to be the favourite for most players- it has that Stampede look about it, it's quite comfortable to hold and the reload switch is in the most acessible intuitive position compared to the other two. 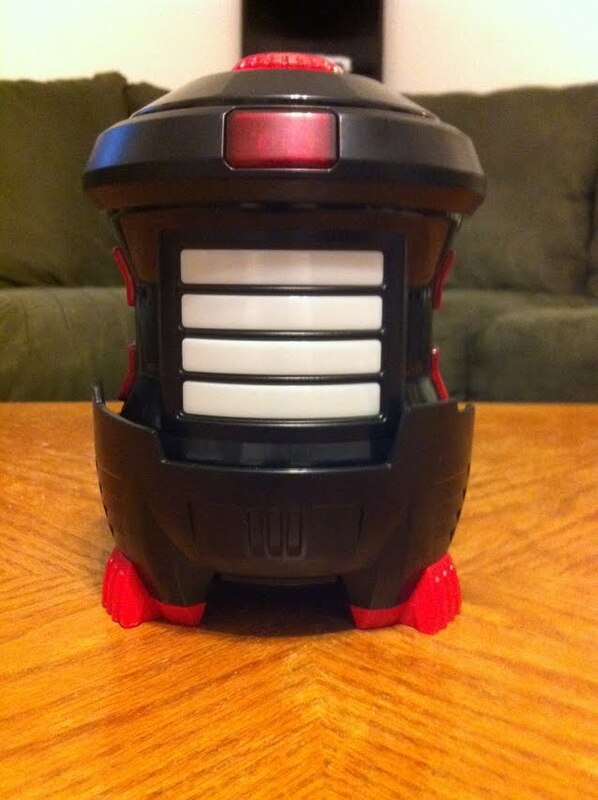 It is a kind of cherry/brown coloured plastic with orange accents which isn't exactly pretty, but of course the nature of how the blasters are made makes repaints a lil fiddly. More after the jump. 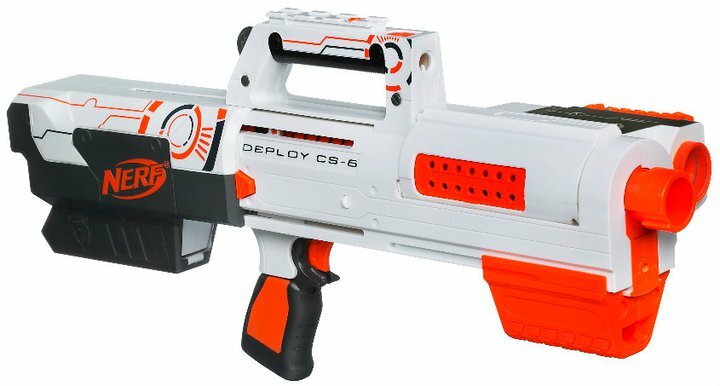 I only just got back from the girl's family birthday dinner so I haven't had a WHOLE lot of time to really give these new Light Strike blasters a proper run, but I thought I'd 1) upload a quick pic spam and 2) offer my initial reactions to this new system and at least put to rest some speculation on them. On the whole, I like them, and I believe they're worth investing in more time and money to get more but whether they're BETTER than our beloved Phoenix LTX's? Well we're just gonna have to see over the weekend. Initial thoughts after the jump. Initial responses (we tried culling the batteries out of the optical mice on our desks, but we couldn't find a screw driver!!) from just appearances alone are that they do look somewhat tacky.. but not nearly as bad as I thought from the photos I'd seen. 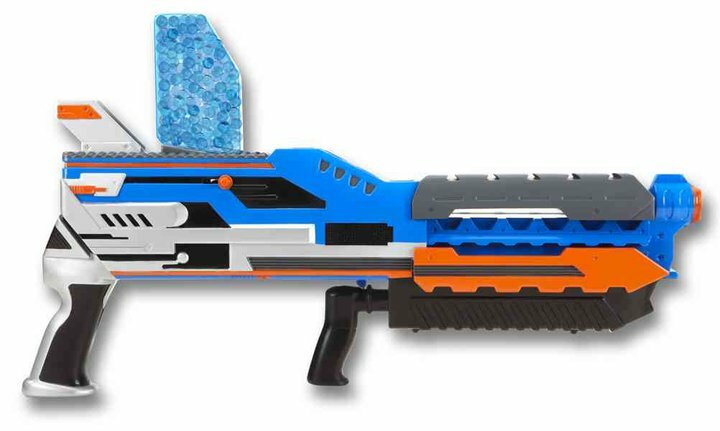 The printed detail on the side of the blasters is on a shiny plastic, so the fear of sweaty hands wearing through the paper is at least not going to be a problem. Every feature on the taggers uses touch sensitive tabs rather than physical buttons and dials, which is sorta cool but not at the same time. The different designs definitely feel different in hand and will be up to user personal preference- so far I'm prefering the orange SR-143 over the red DCR 012 and have still yet to try the GAR 023. Watch this space over the next few days. 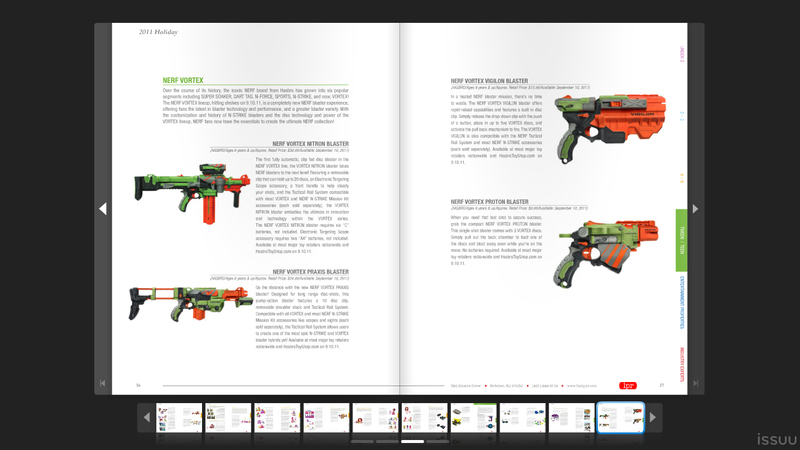 "Pocket: you need to stop getting people's hopes up high about the Nerf Longshot. It is OFFICIAL that the blaster has been discontinued. It happened last year in the States and other countries will follow suit. The stock you Ozzies have is old stock, probably from china and once it's gone, it'll be gone just like it is here. I like your blog but i'm sick of hearing about how the Longshot is available because one day you will go to your stores and realise its gone and wish you did buy up when you could"
Since the Whiteout series was announced, there's been much speculation about how cool it'd be to mix and match the attachments from the Whiteout blasters with the new 2011 Super Soaker line. We've been lucky enough to have the full suite of both lines, and were looking forward to doing a whole lot of mix n matching.. right? 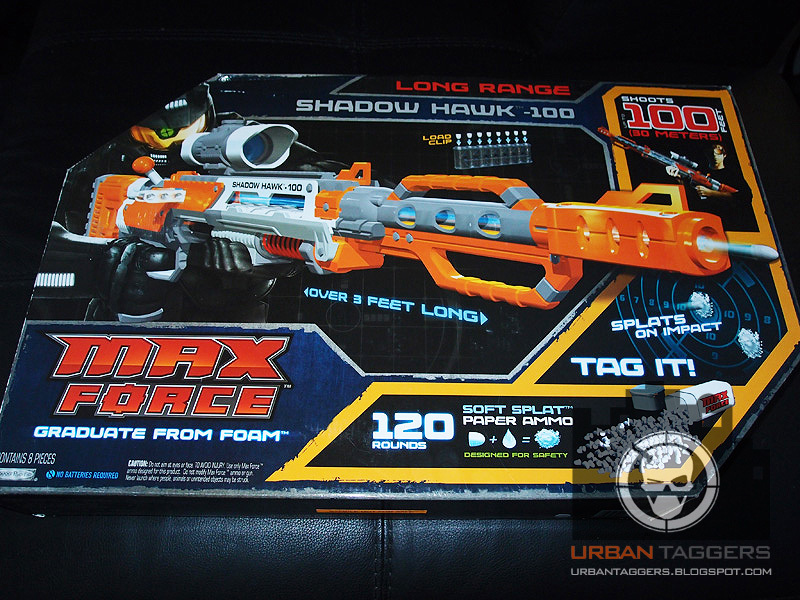 Max Force Shadowhawk: But does it go with my heels? Here's a repaint that came out of nowhere:) Barricade RV-10.. Optimus Prime edition:) Apparently only for Comic-Con for now. Laser Tag in the home arena hasn't REALLY been able to regain its popularity in the domestic backyard market since its glory days of the mid 80's. 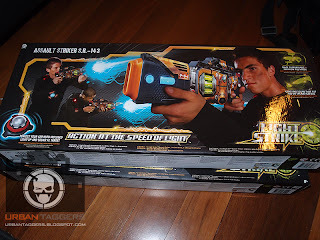 In Australia, it's been pretty woeful; a handful of Toy Box Laser Challenge blasters dribbled in and out of stores and the dominance of Nerf foam blasters meant the new generation were disinterested and on a whole unaware of how cool laser tag really could be. This isn't like Nerf folks, sales are gonna be your friend if Light Strike is your bliss. 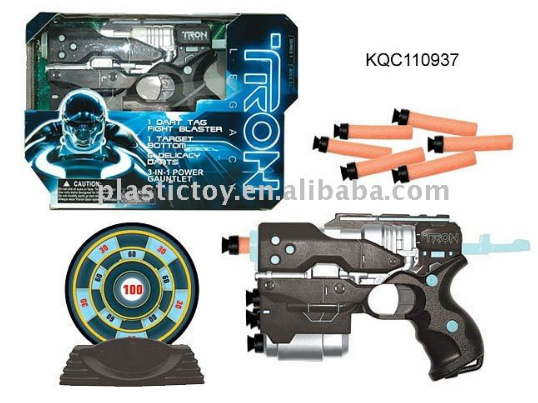 If you think about it this way- a pistol rifle full price will be 79, each attachment goes for around 19 (so chances are you'll probably want at LEAST one, but probably all four), a vest (which is more than just more targets to shoot but a shield as well) is full price at 39.. Then you have batteries as well, you probably will want to pick up pistols too, and extra targets to set up a home arena experience. Realistically speaking, just for a ONE player kit, you're budgeting around 200 bucks.. Now you need a second set for when friends come around. And if you want real fun.. you'll want a team.. also not assuming you're a collector and need all three variants.. Anyway, enough about the costs! That's why I have a day job! More attachments pics after the jump. 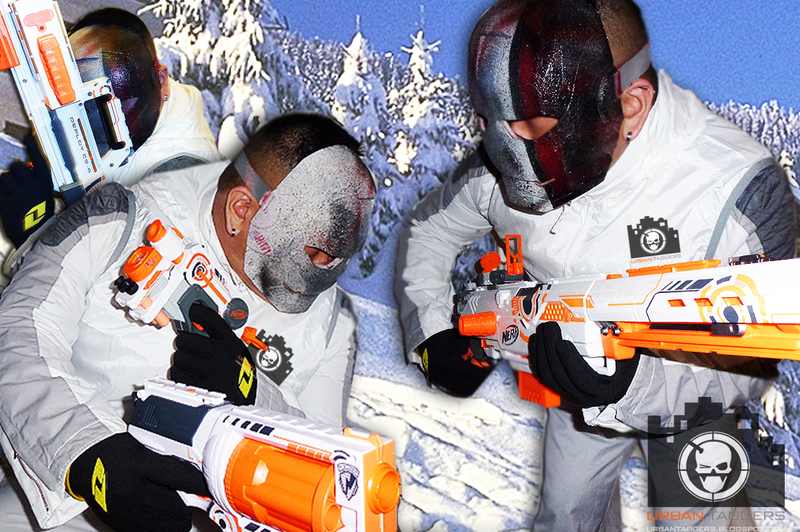 "Official photos of the Nerf Whiteout series have now been posted. Keep checking this page for updates on international availability." Yup, there you have it folks. Today Nerf finally released "official" photos of their Whiteout series on their Facebook page. That being said.. it's interesting the 'tone' Nerf have used with their announcement...it's almost like reluctance more than anything else? 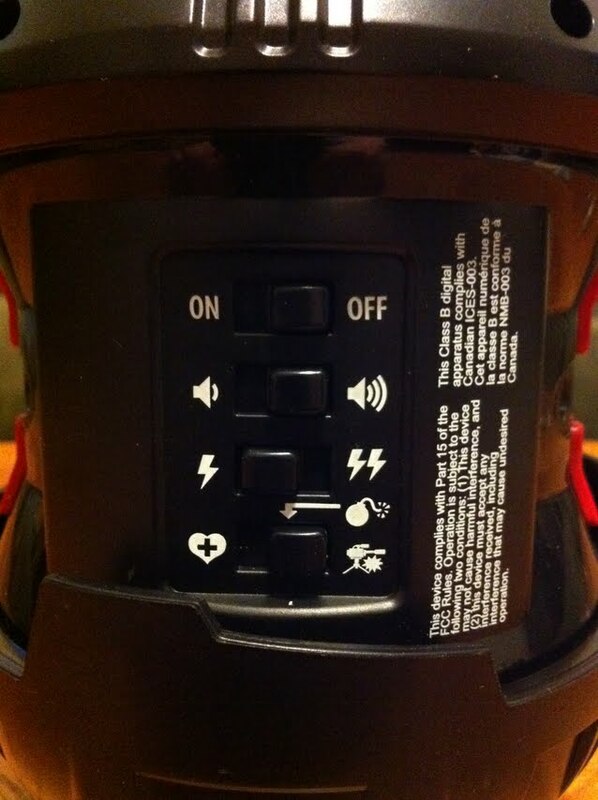 Maybe their PR person is sick today..
"The concept is simple. Three races represented by six guns with bolt on accessories to keep kids wanting to come back for more." 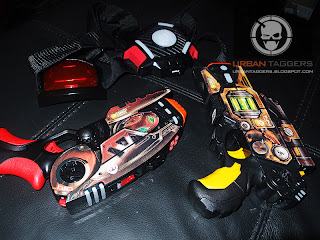 I wanted to write you letting you know I have been a very big fan of your blog for many months, and have taken much of your recommendations and advice on new "blasters" on the market for my kids. 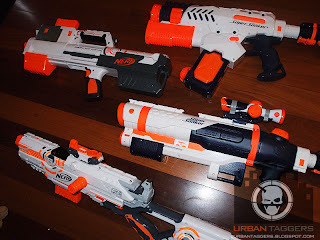 They are religious fans of Nerf, while my husband the big kid himself is always going on about the old super soakers he had as a teenager so it is a topic that brings us all together. Something that I thought was very amusing happened to us last week and I thought I would share it with you even though I normally would not condone this type of behaviour! Suffice to say we've had no retaliation or repeat offences thus far so fingers crossed! For months, our street has been experiencing considerable amounts of vandalism and graffiti between the walkway outside our house from neighbour hood drunk teen pranksters. It has been difficult to catch them in the act, but the other night we were so lucky as to spot two teenaged boys sitting by the side fence breaking glass bottles and "tagging" the electrical box. Joshua, my 13 year old son was the first to spot them and alerted my other boy Nick who is 16, and my husband Dan. 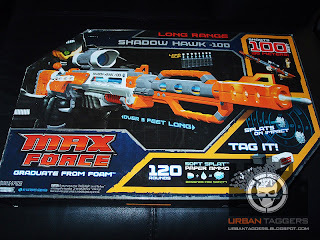 Now...Dan and I had just given Joshua a new Max Force Shadow Hawk based on your Urban Taggers review, for having fantastic grades at school. Of course boys being boys Joshua originally went about using it to deal with our pigeon problem in our upstairs balcony but this time around, he decided with his brother and my husband that he would use it for something else. Apparently the vandal and his friend were making quite the ruckus and had been there for a good 5 minutes. Nick and my husband went on to lean out Joshua's bedroom window balcony and under the cover of darkness, proceeded to shoot the vandals (and the fence) with quite a degree of accuracy with the spitwad gun!! 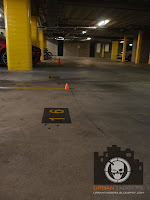 My husband pointed out that due to the Max Force's high velocity firing functionality, the spit wads would just explode on impact but it made it very difficult for the vandals to know where the shots were coming from, let alone in the dark. 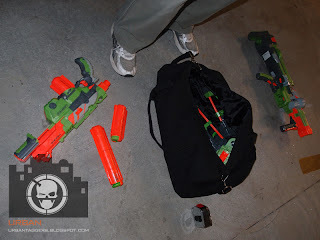 Unlike Nerf darts, the ammunition was wet and could not be easily identified especially under darkness, and because the bullets were completely disposable so there was no need to retrieve anything afterwards. While it was completely harmless, there was enough of splat on impact to scare the bajeezus out of those ratbags. My husband and boys came back down stairs quite satisfied with themselves and could not stop talking about it to me all evening. 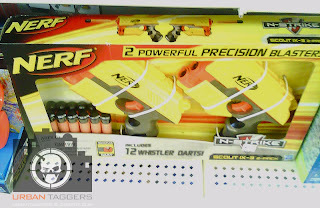 They have gone on to buy more clips and another Shadow Hawk and are interested in other guns in the Max Force line too. As long as it's not in the house, I don't mind! Gear Up Raider CS-35..a real..box. Marketing 101: what's in a name..
One thing that has been bothering my marketing bone since Light Strike was announced is the inconsistencies shown with the actual brand NAME. The importance of branding is to establish recognition with your audience so consistency with something as fundamental as a product name should be pretty rudimentary. 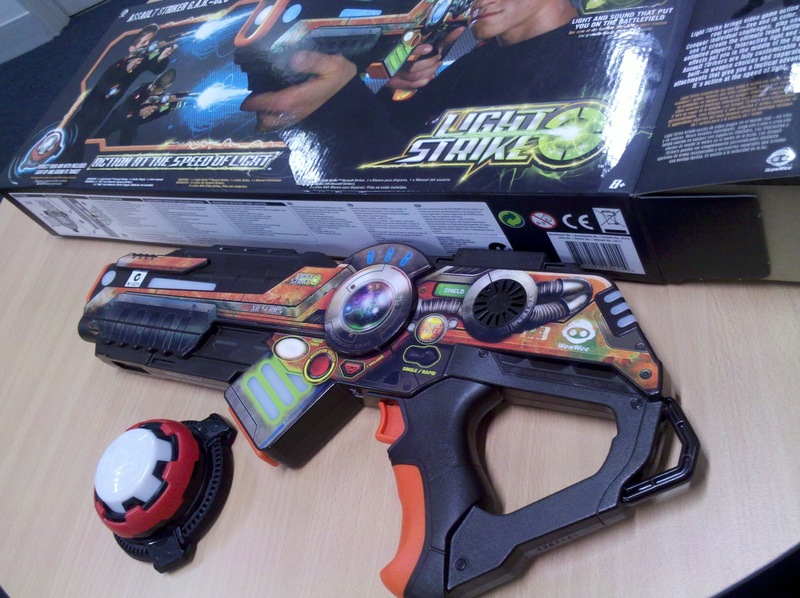 Light Strike official website. 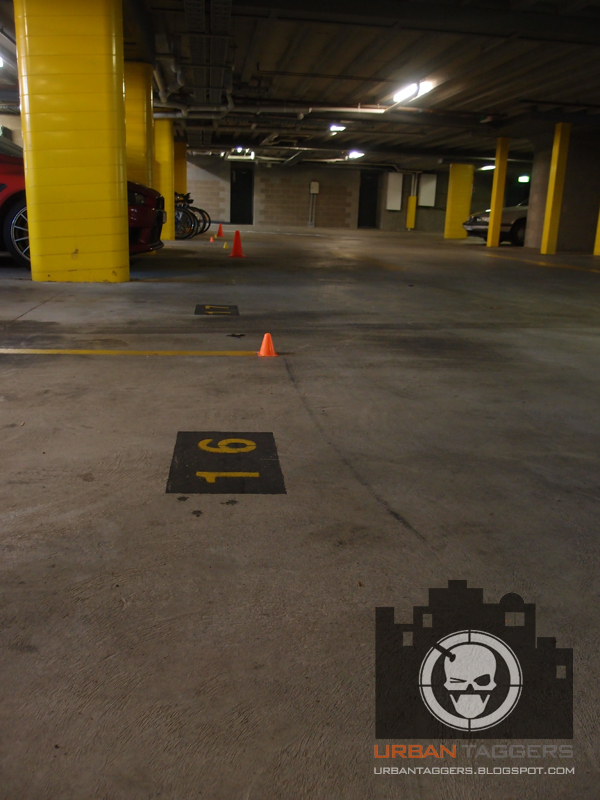 More intel awaits! WowWee have finally launched the official website for their upcoming Light Strike laser tag system. The site looks good but is unfortunately at this stage full of broken links (when I checked there was no actual videos to link to or full listing of products available) and a few typos (One of the blasters is called a "DCR D23" but occasionally changes to "DCP D23" when you're customising the rifles on the cool flash demo thingy) but no doubt that'll be rectified in the following days. We've done a quick summary of intel from the site- more after the jump. *note- videos seem to be up now, and content looks more or less complete! Target's upcoming mid year toy sale will be the last of the big retailers to do their rendition of "Australia's biggest toy sale". 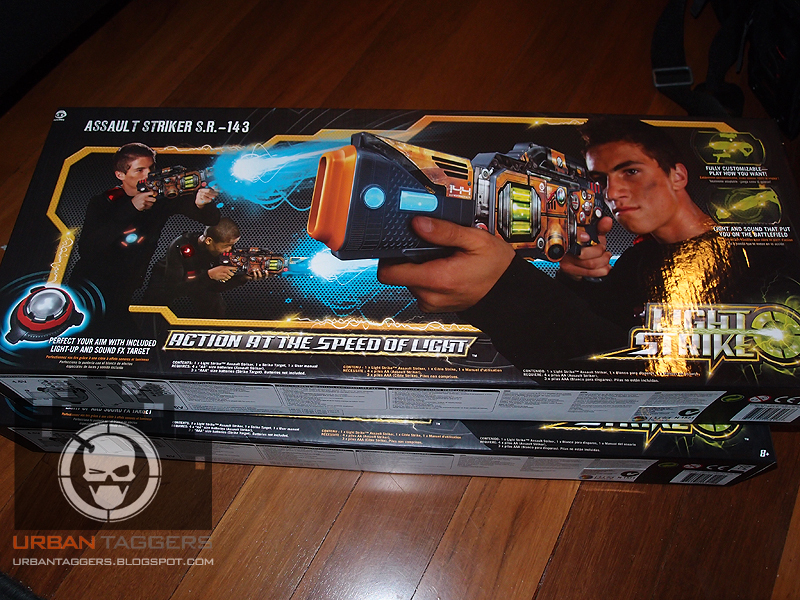 On the whole, it's similar to the other sales as far as Nerf and Max Force is concerned other than the variances in price, but the thing we're most interested in is they seem to (at least for the time being) have the exclusive rights to the new WowWee Light Strike laser tag line. Johnson Arms - The best looking Stampede ECS.. ever. 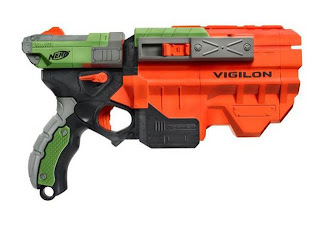 Oh if Nerf only had this as a new colour release..
We absolutely LOVE Johnson Arms' work. For those of you who aren't familiar with the farkin' genius of Brian Johnson, this gentleman takes something normal.. and turns it into a movie prop quality masterpiece. 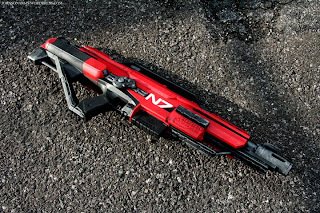 Today he posted an image of a Mass Effect inspired Stampede ECS.. and it deserved a post all on it's own. Rainbow 6 also performed in the 90's as the Backstreet Boys..
Nerf Vortex Nitron. Yup. 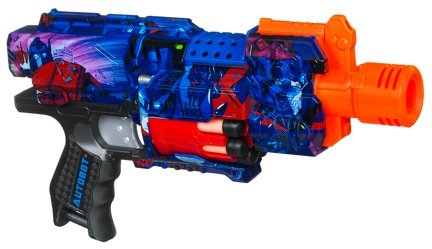 It CAN be fully auto..
Just to let you all know- I can now safely confirm that the Nerf Vortex Nitron IS fully auto. 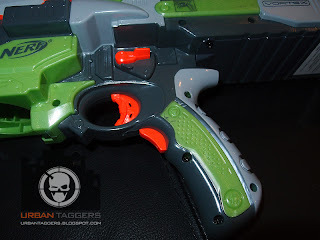 Well.. you still need to keep your finger firmly on the accelerator switch on the grip under the trigger to keep the flywheels going, but keeping the trigger itself pulled constantly will launch the XLR ammo discs one at a time in full auto glory. 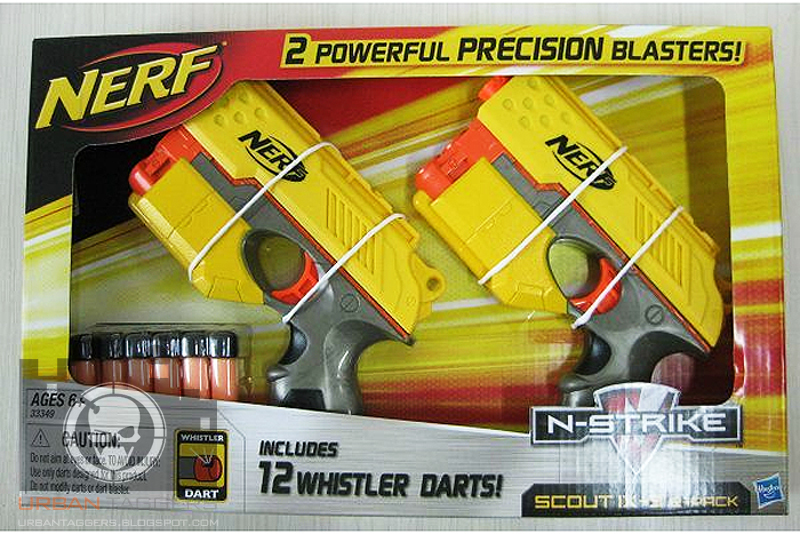 There's about the same delay as an out of the box Stampede in rounds if you were wondering about the rate of fire.